Who wants to bathe in a tub that’s not been cleaned since day one? And use a shower that’s mouldy and rusty with no proper cleaning? Of course, no one. Besides, you will surely feel uncomfortable even just at your first glance. Neither would you want your feet on a tub that has transformed from white to brown nor a shower that’s turning green and pink due to stain and grout, eh? Practically, when this happens, then you should act now. Keep your shower room the best it can be and feel relaxed when letting your guards down. It’s time to consider some DIY tips from professional shower cleaning Perth to give you all the cleaning solutions. When it comes to your bathroom, the mould, mildew, and grout can easily develop from a shower that does not know what cleaning is. With these, comes the growth of bacteria and germs that can be the source of different illnesses. On the other hand, having a clean shower always gives you the comfort that you need. Aside from that, this can also contribute to the cleanliness of your overall bathroom environment. Thus, keeping your bathroom cleaned gives your shower the care it deserves. Keep it more hygienic and prevent bacteria causing illnesses from building up in your abode. Without further ado, here are some tips you can count on when sanitising and cleaning your shower room by the professional shower cleaning Perth. On a daily basis, you need to keep your shower always in a dry condition. You can minimise the growth of moulds and germs if you keep it as dry as possible every after use. This way, it doesn’t only maintain your shower’s clean appearance, but also it minimises foul odour as well. The easiest ways to do it is to squeegee the water that leaves on the wall, the door and the floor. Then, with a towel, wipe the areas again. Remove any leftover moisture. Finally, to reduce humidity, run your vent fan for at least 20-30 minutes. And by slightly opening your bathroom window and curtain for at least an hour. Know what makes your shower dirty. Maybe you didn’t just realise, but actually, the product you’re using is what makes the scum and mould. How is that possible? 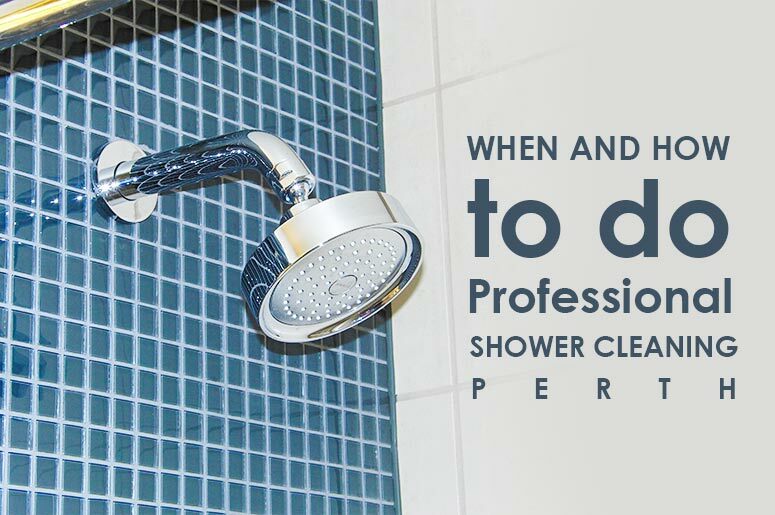 Professional shower cleaning Perth puts the blame on the moisture every time your bathroom is left wet. Nevertheless, some of the products that you use have contents that make the slime and mould to develop. For instance, your shampoo has dye contents that can stain grout. Including the conditioner or even the body scrub that you’re using. That may also contain factors in the growth of mildew and slime. Hence, the best and easiest cleaning way from professional shower cleaning Perth is to double check these products before using them. Do not store those stuff directly on the floor. Keep it on a shelf or a shower caddy. This way, it can prevent from leaving a moist to your shower floor. Whether you agree or not, there is always that inevitable moisture that remains no matter how you keep your shower dry. Naturally, this moisture causes the slime, mould, and mildew to grow. And, when these mould and slime pile up, it’ll now turn into stain and grout. Therefore, before this can happen, try to spray your shower to disinfect. For a better result, professional shower cleaning Perth suggests that you can do the spray two to three times a week. Using the mixture of a diluted water cleaner, full-strength white vinegar and a few drops of tea tree oil. This solution can combat scum and slime. In fact, this also fights with mildew and mould. Once you’ve sprayed it all up, allow your shower to dry. Just an important note, exclude vinegar from the mixture for travertine or stone made bathtub and or showers. Related: How to Do an Effective Deep Cleaning Bathroom Tasks? This is to prevent grout build up. Using a soft scrub brush, measure two parts of water and one part of vinegar. Then brush up your shower, removing slime and mould. Actually, you can choose to do grout cleaning once a month. Or, you can do only during you free and most convenient time. However, it’s recommended to clean your grout once a week. Especially when there are more than two people using the shower. Well, the important thing is that you know when your shower needs to be cleaned and how to clean it the easiest way. It is always recommended that you maintain the cleaning that your shower deserves. Accordingly, you don’t need that long list of ways on how to do the cleaning. After all, the most essential is that you keep all the members of your family healthy and germ-free. And these, are one of the many ways that professional shower cleaning Perth have found to keep your shower more hygienic in easy ways. Remove those slime and mould and get away from bacterial diseases. Find the solution right here on our website. We can also do all the slime, stain and grout cleaning for you. All our cleaners are professional, licensed and are expert in all house cleaning services that you need. Get in touch with us and we are always ready to assist you. This entry was posted in Cleaning Services, Home Cleaning, House Cleaning, Spring Cleaning and tagged cleaning, cleaning perth, professional cleaning perth, professional shower cleaning, shower cleaning, shower cleaning perth.